So, you just got a solar panel that has no polarity labels. How can you figure out the proper polarity, which terminal or wire is plus and which is minus? Here’s a couple of easy tips that can even be done inside, away from the sun. The negative of the bypass diode (i.e. 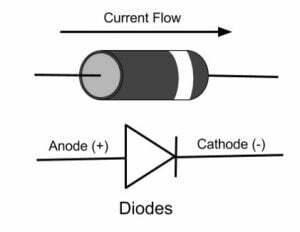 the cathode) in a bypass diode is located with the positive of the solar panel. If you can open up the junction box, you will likely see at least one bypass diode inside. This is to help prevent power loss due to shading of a solar panel. It provides an alternative path for the current when the panel is shaded, and therefore at a higher resistance. There may only be one diode, which bypasses the whole panel in a solar array, as seen in the diagram, or multiple diodes, bypassing cells within the solar panel itself, as seen in the picture. The striped cathode of the diode will be pointing towards the positive side of the solar panel. The other side is negative. For more information on diodes in a solar system, watch our video Blocking and Bypass Diodes in a Solar Panel Systems. 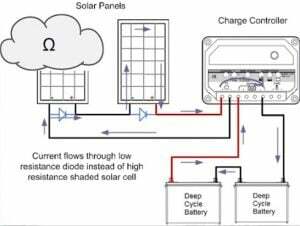 Another way to find the polarity of the solar panel is to check with a voltmeter. A simple voltage reading will show you the polarity of a solar panel, even when inside. 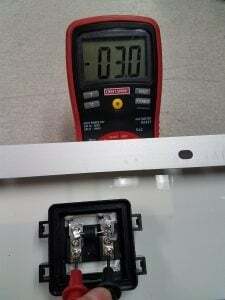 To measure across the solar panel terminals or wires, put the red positive meter lead on one side, and the black negative on the other. Set the voltmeter to read DC Volts. If the voltmeter shows a negative number, indicated by a minus symbol, the leads are the wrong direction. Switching them over shows a positive number, with no negative symbol, so the red meter lead is on the positive, and the black meter lead is on the negative. Note in the pictures you can also see the bypass diode in the junction box. You can see the stripe of the diode is on the side with the red positive lead, proving the previous method correct. The solar panel is only putting out 3 volts, because it is upside down inside the building, and just getting a little light hitting it. But it is enough to get a correct polarity reading. 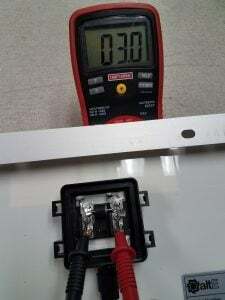 If you were to try to measure current, there likely would be none with such little light, as the voltage is less affected by the intensity of light than current is.